Professor Ashraf Ayoub obtained his MSc and PhD in Civil Engineering from the University of California-Berkeley, USA. While a post graduate student, his research work was selected as a finalist for the international Robert Melosh medal in finite element analysis awarded by the International Association of Computational Mechanics and Duke University. He was later awarded a post-doctoral fellowship at the John A. Blume Earthquake Engineering Center at Stanford University. He was previously on the faculty at the University of Houston and the University of Missouri-Rolla. 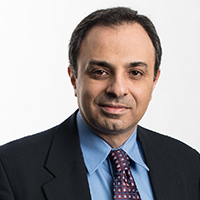 Professor Ayoub's current research work is in the field of analysis and design of nuclear infrastructure systems, nonlinear finite element analysis, constitutive modeling of materials, earthquake engineering, health monitoring of structures, and high-performance construction materials. Prof. Ayoub is the current chair of the ASCE committee on Emerging Computing Technologies, and the past chair of Joint ACI-ASCE Committee 447, Finite Element Analysis of Reinforced Concrete Structures. He is also a member of ACI committee 440, Fiber Reinforced Polymer Reinforcement; and a member of ASCE Technical Activity Committee (TAC) on Analysis and Computation. He currently serves on the editorial board of the Journal of Structural Engineering, ASCE, handling papers in the area of advanced computational techniques. Professor Ayoub was the principal or co-principal investigator of several research projects awarded by different organizations such as the US National Science Foundation, the US Department of Energy, the US National Cooperative Highway Research Program (NCHRP), the US Department of Defense, the Florida and Texas Departments of Transportation, and Hillsborough County. The total amount of funding received from these organizations exceeded $5,000,000. These research projects resulted in over 100 articles co-authored with his students, and published in refereed technical journals and conference proceedings in the area of structural engineering. Faghih, F. and Ayoub, A.S. (2019). Structural performance of steel-concrete sandwich beams with carbon nanofiber reinforcement. Engineering Structures, 187, pp. 177–198. doi:10.1016/j.engstruct.2019.02.051 . Labib, M., Moslehy, Y. and Ayoub, A. (2013). Behavior of reinforced concrete membrane elements subjected to bidirectional shear loads. ACI Structural Journal, 110(6), pp. 1033–1043. Ayoub, A. and Mullapudi, R.S. (2013). Analysis of Reinforced Concrete Columns Subjected to Combined Axial, Flexure, Shear and Torsional Loads. Journal of Structural Engineering, 139(4), pp. 548–560. Ayoub, A. (2010). Finite-Element Model for Pretensioned Prestressed Concrete Girders. Journal of Structural Engineering, 136(4), p. 401. Mullapudi, T.R. and Ayoub, A. (2010). Modeling the seismic behavior of shear-critical reinforced concrete columns. Engineering Structures, 32(11), pp. 3601–3615. Ayoub, A., Chenouda, M. and ASCE, A.M. (2008). Inelastic Displacement Ratios of Degrading Systems. Journal of Structural Engineering, 134(6), pp. 1030–1045. Ayoub, A. (2005). A force-based model for composite steel-concrete beams with partial interactio. Journal of Constructional Steel Research, 61(3), pp. 387–414. Ayoub, A. (2003). Mixed formulation of non-linear beam on foundation elements. Computers and Structures, 81(7), pp. 411–421. Ayoub, A. and Filippou, F. (2000). Mixed formulation of non-linear steel-concrete composite beam element. Journal of Structural Engineering, 126(3), pp. 371–381. Ayoub, A. and Filippou, F. (1999). Mixed formulation of bond slip problems under cyclic loads. Journal of Structural Engineering, 125(6), pp. 661–671. Tamanani, M. and Ayoub, A. (2017). Dynamic Time History Response of Irregular Bridges. Moslehy, Y., Labib, M., Mullapudi, T.R.S. and Ayoub, A. (2015). Development of a new constitutive model for analysis of RC elements retrofitted with FRP. You, Y.M., Ayoub, A., Bae, S.W. and Belarbi, A. (2015). Numerical simulation of FRP shear-strengthened reinforced concrete girders. Faghih, F. and Ayoub, A. (2014). Finite element modeling of carbon nanofiber concrete structural members. Mohammadi-Tamanani, M., Gian, Y. and Ayoub, A. (2014). Design of bridges with unequal pier heights. Ravi Mullapudi, T. and Ayoub, A. (2018). Fiber Beam Analysis of Reinforced Concrete Members with Cyclic Constitutive and Material Laws. International Journal of Concrete Structures and Materials, 12(1). doi:10.1186/s40069-018-0286-z . Temami, O., Ayoub, A., Hamadi, D. and Bennoui, I. (2018). Effect of Boundary Conditions on the Behavior of Stiffened and Un-Stiffened Cylindrical Shells. International Journal of Steel Structures. doi:10.1007/s13296-018-0173-0 . Mehanny Gendy, S.S.F. and Ayoub, A. (2018). Displacement and mixed fibre beam elements for modelling of slender reinforced concrete structures under cyclic loads. Engineering Structures, 173, pp. 620–630. doi:10.1016/j.engstruct.2018.07.008 . Gendy, S.S.F.M. and Ayoub, A. (2018). Explicit Fiber Beam-Column Elements for Impact Analysis of Structures. Journal of Structural Engineering, 144(7), pp. 4018068–4018068. doi:10.1061/(asce)st.1943-541x.0002061 . Zomorodian, M., Yang, G., Belarbi, A. and Ayoub, A. (2018). Behavior of FRP-strengthened RC elements subjected to pure shear. Construction and Building Materials, 170, pp. 378–391. doi:10.1016/j.conbuildmat.2018.03.004 . Labib, M., Moslehy, Y. and Ayoub, A. (2018). Softening coefficient of reinforced concrete elements subjected to three-dimensional loads. Magazine of Concrete Research, 70(1), pp. 11–27. doi:10.1680/jmacr.17.00094 . Zomorodian, M., Belarbi, A. and Ayoub, A. (2017). Finite element model for predicting the shear behavior of FRP-strengthened RC members. Engineering Structures, 153, pp. 239–253. doi:10.1016/j.engstruct.2017.10.033 . Faghih, F., Das, D. and Ayoub, A. (2017). Seismic Behavior of Fiber Reinforced Steel-concrete Composite Systems. Procedia Engineering, 171, pp. 899–908. doi:10.1016/j.proeng.2017.01.386 . Tamanani, M., Gian, Y. and Ayoub, A. (2016). Evaluation of code criteria for bridges with unequal pier heights. Bulletin of Earthquake Engineering, 14(11), pp. 3151–3174. doi:10.1007/s10518-016-9941-4 . Zomorodian, M., Yang, G., Belarbi, A. and Ayoub, A. (2016). Cracking behavior and crack width predictions of FRP strengthened RC members under tension. Engineering Structures, 125, pp. 313–324. doi:10.1016/j.engstruct.2016.06.042 . Yang, G., Zomorodian, M., Belarbi, A. and Ayoub, A. (2016). Uniaxial tensile stress-strain relationships of RC elements strengthened with FRP sheets. Journal of Composites for Construction, 20(3). doi:10.1061/(ASCE)CC.1943-5614.0000639 . Hamadi, D., Ayoub, A. and Maalem, T. (2016). A new strain-based finite element for plane elasticity problems. Engineering Computations (Swansea, Wales), 33(2), pp. 562–579. doi:10.1108/EC-09-2014-0181 . Moslehy, Y., Labib, M., Ayoub, A. and Mullapudi, R. (2016). Influence of Fiber-Reinforced Polymer Sheets on the Constitutive Relationships of Reinforced Concrete Elements. Journal of Composites for Construction, 20(2). doi:10.1061/(ASCE)CC.1943-5614.0000616 . Hamadi, D., Ayoub, A. and Abdelhafid, O. (2015). A new flat shell finite element for the linear analysis of thin shell structures. European Journal of Computational Mechanics, 24(6), pp. 232–255. doi:10.1080/17797179.2016.1153401 . Ahumada, A., Altunkaynak, A. and Ayoub, A. (2015). Fuzzy logic-based attenuation relationships of strong motion earthquake records. Expert Systems with Applications, 42(3), pp. 1287–1297. doi:10.1016/j.eswa.2014.09.035 . Ozkul, S., Ayoub, A. and Altunkaynak, A. (2014). Fuzzy-logic based inelastic displacement ratios of degrading RC structures. Engineering Structures, 75, pp. 590–603. doi:10.1016/j.engstruct.2014.06.030 . Labib, M., Sheu, W., Ayoub, A. and Mo, Y.L. (2014). Embedded steel plate supports in concrete tilt-up precast walls. Magazine of Concrete Research, 66(12), pp. 627–642. doi:10.1680/macr.13.00118 . Mullapudi, T.R.S. and Ayoub, A. (2013). Non-linear analysis of reinforced concrete walls under three-dimensional loading. MAGAZINE OF CONCRETE RESEARCH, 65(3), pp. 172–184. doi:10.1680/macr.12.00038 . Labib, M., Mullapudi, R. and Ayoub, A. (2013). Analysis of RC structures subjected to multi-directional shear loads. Journal of Advanced Concrete Technology, 11(2), pp. 22–34. doi:10.3151/jact.11.22 . Mullapudi, T.R.S., Charkhchi, P. and Ayoub, A. (2013). Behavior of shear-dominant thin-walled RC structures. Thin-Walled Structures, 63, pp. 134–146. doi:10.1016/j.tws.2012.10.004 . Labib, M., Moslehy, Y. and Ayoub, A, (2013). Evaluation of the Constitutive Behavior of Reinforced Concrete Membrane Elements subjected to Bi-directional Shear Loads. ACI Structural Journal, 110(6), pp. 1033–1044. Mullapudi, T.R., Gao, D. and Ayoub, A. (2013). Nondestructive evaluation of carbon-nanofibre concrete. Magazine of Concrete Research, 65(18), pp. 1081–1091. Mullapudi, T.R. and Ayoub, A. (2013). Constitutive behavior of a fiber-based beam element for reinforced concrete modeling under cyclic loading. Studies and Researches, 32, pp. 13–50. Ayoub, A. (2012). Analysis of composite frame structures with mixed elements – state of the art. Structural Engineering and Mechanics, 41(2), pp. 157–181. Howser, R., Moslehy, Y., Gu, H., Dhonde, H., Ayoub, A. and Song, G. (2011). Smart-aggregate-based damage detection of fiber-reinforced-polymer-strengthened columns under reversed cyclic loading. Smart Materials and Structures, 20(7). You, Y., Ayoub, A. and Belarbi, A. (2011). Three-dimensional nonlinear finite element analysis of prestressed concrete beams strengthened in shear with FRP composites. Journal of Composites for Construction, 15(6), pp. 896–907. Ayoub, A. (2011). Nonlinear finite element analysis of post-tensioned concrete bridge girders. Journal of Bridge Engineering, 16(3), pp. 479–489. Lu, F. and Ayoub, A. (2011). Evaluation of debonding failure of reinforced concrete girders strengthened with FRP laminates. Construction and Building Materials, 25(4), pp. 1963–1979. Ayoub, A. and Mullapudi, R. (2010). Nonlinear finite element modeling of beams on two-parameter foundations. Computers and Geotechnics, 37, pp. 334–342. Ayoub, A. and Filippou, F. (2010). Nonlinear analysis of pre-tensioned prestressed concrete girders. Journal of Structural Engineering, 136(4), pp. 401–409. Newman, N., Ayoub, A. and Belarbi, A. (2010). Development length of straight FRP Composite bars embedded in Concrete. Journal of Reinforced Plastics and Composites, 29(4), pp. 571–589. Mullapudi, T.R. and Ayoub, A. (2010). Inelastic analysis of semi-infinite foundation elements. Mechanics Research Communications, 37(1), pp. 72–77. Chenouda, M. and Ayoub, A. (2009). Probabilistic collapse analysis of degrading MDOF structures under earthquake excitations. Engineering Structures, 31(12), pp. 2909–2921. Mehrani, E., Ayoub, A, and Ayoub, A, (2009). Condition assessment of reinforced concrete bridges using structural health monitoring techniques - a case study. Smart Structures and Systems, 5(4), pp. 381–396. Ayoub, A. and Chenouda, M. (2009). Response spectra of degrading structural systems. Engineering Structures, 31(7), pp. 1393–1402. Mehrani, E., Ayoub, A. and Ayoub, A. (2009). Evaluation of fiber optic sensors for remote health monitoring of bridge structures. Materials and Structures, 42(2), pp. 183–199. Mullapudi, T.R. and Ayoub, A. (2009). Fiber beam element formulation using the softened membrane model. ACI-Special Publication SP-265 pp. 283–308. Mullapudi, T.R., Charkhchi, P. and Ayoub, A. (2009). Evaluation of behavior of RC shear walls through finite element analysis. ACI-Special Publication SP-265 pp. 73–100. Labib, M., Moslehy, Y. and Ayoub, A. (2009). Evaluation of the constitutive behavior of concrete elements subjected to a tri-directional shear load using a state-of-the-art panel tester. ACI-Special Publication SP-265 pp. 455–476. Bae, S.W., Laboube, R., Belarbi, A. and Ayoub, A. (2008). Progressive collapse of cold-formed steel framed structures. Thin Walled Structures, 46, pp. 706–719. Mehanny, S. and Ayoub, A. (2008). Variability in inelastic displacement demands: Uncertainty in system parameters versus randomness in ground records. Engineering Structures, 30(4), pp. 1002–1013. Lu, F. and Ayoub, A. (2008). Effect of bond properties on the behavior of FRP-strengthened RC girders subjected to monotonic and cyclic loads. ACI Special Publication SP-258 pp. 117–136. Ayoub, A. (2007). Nonlinear Analysis of wood building structures. Engineering Structures, 29(2), pp. 213–223. Ayoub, A. (2007). Nonlinear analysis of reinforced concrete beam-columns with bond-slip. Journal of Engineering Mechanics, 132(11), pp. 1177–1186. Ayoub, A. (2001). A two-field mixed variational principle for partially connected composite beams. Finite Elements in Analysis and Design, 37, pp. 929–959. Demirol, E. and Ayoub, A. Inelastic Displacement Ratios of SSI Systems. Soil Dynamics and Earthquake Engineering. Ayoub, A. and Gendy, S. Dipslacement and Mixed Fibre Beam Elements for Modelling of Slender Reinforced Concrete Structures under Cyclic Loads. Engineering Structures. Professor Ayoub teaches courses in structural analysis and mechanics, elastic and inelastic finite element analysis, structural dynamics and earthquake engineering, nuclear infrastructure systems, and design of reinforced concrete structures. He was awarded the Cullen College of Engineering Outstanding Teaching Award at the University of Houston for academic year 2008-2009.